WASHINGTON, April 14 (NNN-KYODO) – Finance chiefs of the Group of 20 major economies affirmed the need to take “timely” policy action to better cope with downside risks in the world economy, Bank of Japan Governor Haruhiko Kuroda said. Speaking after a two-day meeting in Washington, Kuroda said each G-20 nation “needs to ensure it will take steps to mitigate risks, not to heighten them,” citing policy uncertainties such as an escalation in trade tensions between the United States and China, as well as deterioration in corporate sentiment. The BOJ chief led the meeting with Finance Minister Taro Aso. Japan has taken the presidency of the group for the first time and Prime Minister Shinzo Abe will host a G-20 summit on June 28 and 29 in Osaka. Aso said the balance of risks to global growth “remains skewed to the downside,” alluding to a possible escalation of trade tensions, a potentially disorderly exit of Britain from the European Union and the chance of a sudden sharp tightening of global financial conditions. 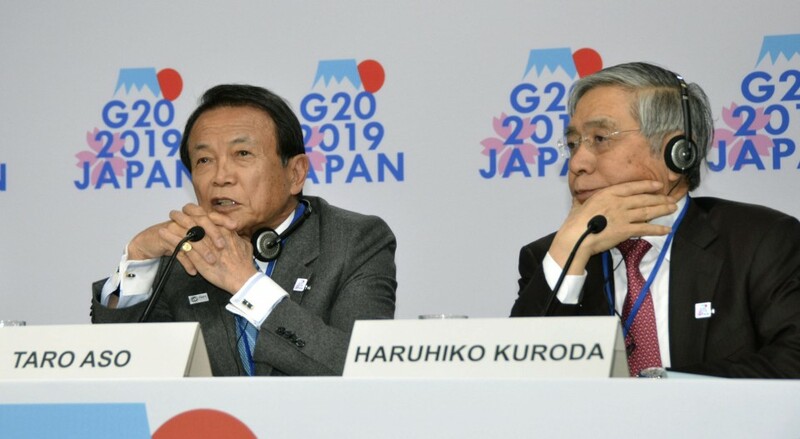 The G-20 finance ministers and central bank governors “reaffirmed that all policies choose to support strong, sustainable, balanced and inclusive growth to be used in a timely fashion,” Aso said at a joint news conference with Kuroda. “Given the global and macroeconomic nature of this issue, we need to tackle it in a multilateral and macroeconomic context, rather than (through) a bilateral trade perspective,” he said, in a veiled counter to the preference by U.S. President Donald Trump’s administration of a bilateral approach. Aso indicated Japan wants the United States to shift its focus from bilateral goods trade deficits with Japan, China and other countries to the balance of services trade and returns on overseas investments as part of efforts to address global imbalances. The G-20, meanwhile, attributed the expected rebound to easing global financial conditions propelled by the U.S. Federal Reserve’s recent decision to pause its rate-increase cycle, the effects of stimulus measures by China and other countries and an improved outlook for negotiations between Washington and Beijing for a trade agreement, according to Japanese officials. The G-20’s forecast was in line with the projected 3.6 percent growth for the world economy in 2020, up from an estimated 3.3 percent in 2019, in the latest outlook released Tuesday by the International Monetary Fund. 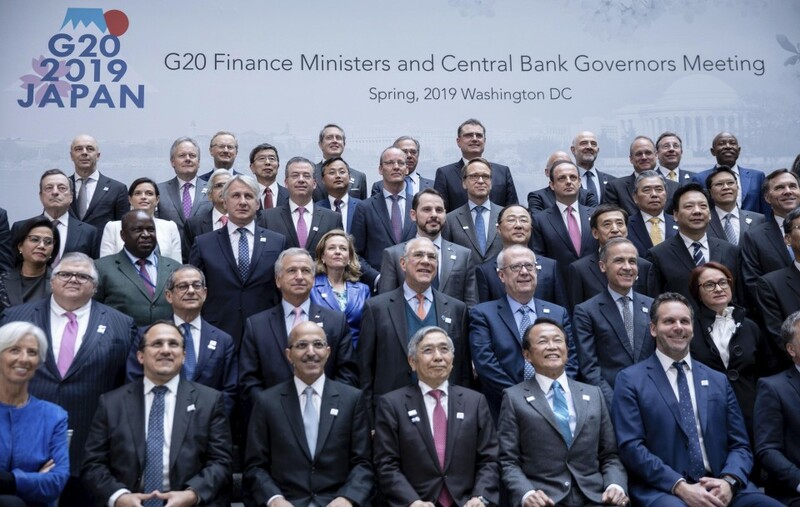 The G-20 met on the sidelines of the annual spring meetings of the IMF and World Bank to pave the way for a June 8-9 gathering of the G-20 finance ministers and central bank chiefs in Fukuoka, western Japan.